When I read the synopsis of this episode I was genuinely amazed to see the words “Guardian” and “James” mentioned. Like, at all. Do you know what the last episode was to have James in a large enough role to warrant mention in the pre-episode synopsis? Episode 10 of this season, when he was first getting into his role as Guardian and wanted to come clean to Kara about being a vigilante. James Olsen hasn’t had his own plot — even a minor one — in ten episodes, and I’m willing to bet that the handful of appearances he did make during that run probably averaged about five minutes per episode. As a character, James has gone from lead romantic interest to barely a character at all. 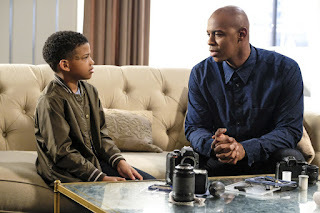 I don’t think I’ve ever seen a character more thoroughly demoted than James Olsen has been on Supergirl, which makes me wonder what drama occurred behind the scenes. Because you don’t throw out a whole character and his entire established friendship with the protagonist like this on a writing whim. This week, “City of Lost Children” tries to correct some of the sidelining the show’s been doing to James by giving him stuff to do and a pivotal role in the episode’s main story. But is it a quality effort? JAMES OLSEN AS "SIR FINALLY-APPEARING-IN-THIS-SHOW"
Apparently people in National City are terrified of Guardian now, even though he was so popular that Kara got jealous of him back when she didn’t know he was James. After Guardian saves a lady being attacked, she immediately turns against him and starts begging for her life. James repeatedly tries to tell her that he’s a hero and she doesn’t have to be afraid (which he shouldn’t have to do because — I reiterate — Guardian has been around for months and should be well-known) but she runs off screaming. James is sad. He expresses his concerns to Winn while they’re out walking in the rain through a park festival. The superheroing business just doesn’t seem very welcoming to him anymore. People fear him. He can’t connect with anyone the way Supergirl and Superman get to connect with the people they save, because James has to wear an intimidating mask and talk in a stupid Batman voice or else people might recognize him. If only the magic glasses that prevent Kara and Clark from being recognized worked on regular humans, then James could slap on a pair of spectacles and rescue to his heart’s content while smiling reassuringly. Winn gives James some half-hearted encouragement, then the plot comes along in the form of a floating lady with purple eyes, who telekinetically destroys everything around them. James, because heroism does come naturally to him, saves a couple from getting smashed by a flower cart. They don’t thank him. The people in this city are rude. When Purple Eyes brain-waves a car toward a building, Supergirl shows up to stop the flying vehicle. Without confirming that the chaos and danger has ended, the people in the park stop to applaud Supergirl catching a car. Luckily, Purple Eyes has stopped her attack at this point and disappeared, but still. What is wrong with the denizens of National City? Is there something in the water that makes them goofy and awful? Does the DEO need to check into this? Speaking of the DEO: back at headquarters, we’re informed that the alien species Purple Eyes belongs to is called the Phorian, a normally peaceful race of psychic aliens who would not be attacking National City under any normal circumstances. J’onn rejects James’s request to investigate the Phorian as Guardian, but James lucks into a lead when he stops an alien drug deal and, coincidentally, the alien buying some weed happens to know where the Phorian lady lives. At the address, James sees no Lady but does find a kid named Marcus, the woman’s son. Marcus doesn’t talk to anyone, even when James takes him back to the DEO and Alex tries to entice him with hamburgers. But then they notice that he seems to be staring at James through the wall and get the idea that maybe James will be the one to get through to him. James gets to play caretaker for the day. Thus begins the show’s half-hearted attempt to give James a story arc through his interaction with Marcus, jumping off from the “everyone is afraid of me and I’m not making any connections with the people I save” start of the episode and ending with James finally getting Marcus to talk, connecting over the shared loss of their fathers, and snapping Marcus out of the purple-eyed trance he and his people go through whenever their psychic powers are activated. Disappointingly, “City of Lost Children” would be a pretty good storyline for James if everything they used to establish the slump he has fallen into hadn’t simply been told to us in this episode, not shown over the course of the season. Because the show has spent all season ignoring the existence of James and his identity as Guardian, everything about his character in this episode comes out of nowhere and the resolution is unimpressive as a result. Suddenly learning that a character has problems and then solving those problems, all in the same episode, is not a very exciting arc. RHEA AND LENA AND BETRAYAL, OH MY! But what was causing the Phorian telekinetic trances, exactly? It turns out that it was the transporter device Rhea had roped Lena into helping her develop last episode, which sends the Phorians into their destructive psychic states whenever activated. Not that Lena knows her device is hurting people. Even Rhea probably doesn’t know the machine is affecting anyone, but I’m pretty sure she wouldn’t care if she did. Once Winn and the other nerds at the DEO figure out that an atmospheric change is causing the Phorian episodes (though they don’t realize that the atmospheric change is caused by the Lena and Rhea transporter) they come up with a machine that can dampen the effects and then get Marcus to lead James and Winn to his mother. To their surprise, it’s not just the mother hiding out — at least a dozen Phorians are with her, which is far more than what the DEO machine can cover, and this is where James’s connection with Marcus saves the day and proves he’s a true hero. In contrast, at the same moment James is learning he’s a hero, Lena is learning that her new friend is a villain. Just like pretty much everything surrounding Lena, her mentee/mentor relationship with Rhea — who offers her true, encouraging advice about her intelligence and how she shouldn’t live in Lex’s shadow — is heartbreaking to watch unfold and then unravel. Lena seems to be someone who genuinely wants to change the world not because it’s a way to gain power or glory, but because changing the world is the right thing to do. We learned in the episode with her ex-boyfriend that she once worked on curing cancer, and this episode we hear that her priorities for the transporter device are all about solving hunger and water crises and ending human suffering. Then Rhea betrays Lena, knocks her out, and uses the transporter to let hundreds of Daxam ships into Earth’s atmosphere. I’m just saying, if Lena does turn evil it’s probably going to be because of all these trust issues she’s developed. The Kara/Lena lunch at the beginning just made me wish those two could have a whole episode of adventures together. Even in the episode that’s supposed to pull him back into the main plot, James still has only one scene with Kara. Nice job, show. Rhea says something to Kara that’s like something Mon-El has said to her (about Kara’s ego and a need to be the hero just to feel adored) and for a moment I thought the show was self-aware regarding the questionable goodness of the Mon-El character. Alas, no. I can’t even tell you how much I wish Mon-El had shot his mother when he had the chance. It would have made him and his role on the show so much more interesting if he was the sort of person who would shoot his evil mom to save Earth/Kara. J’onn J’onzz calling the Danvers sisters his family is something I need more of. CAT GRANT IS COMING BAAACK!